Hello! So I had an intense sore throat this morning. Our lecture was at 8:00 today, which meant I had to get up at 5:00. After I got up, I couldn't even open my mouth to brush, as my throat was paining due to the soreness. I sat for five minutes, alone in the living room, thinking hard about missing on today's lectures. I'm a girl who would give anything up, just in order to attend the lectures. However, I thought and came onto a conclusion of resting for the day, in spite of the strictness I possessed about attending lectures. I immediately messaged a very good friend and a classmate of mine, who travels with me to the college every day, about my absence for the day. I was also a bit sad, as the outfit I had chosen was a pretty good one. Nevertheless, I still let my eyelids rest. Wear a warmer set of clothes if you have had a fever the previous day. If you don't wear warm clothes, chances are you catching fever again. Also, ladies, if you're on your period, it is advisable to wear a darker shade of pants along with a longer t-shirt, in order to avoid horrible scenes, if they happen. Also, if you have loose motions or a stomach ache, avoid wearing tight clothes. As if you tuck in your stomach in order to make it look flat, you might give trouble to your little tummy, and it will be even more upset at you. If you have a cold, needless to say, carry a kerchief. If you're on your periods, girls, carry a sanitary pad with you. It's better to have one of yours, rather than asking the fellow females. Keeping yourself hydrated while ill is very important. You are going to require energy constantly, and a bottle of water or an energy drink would be of great help. Carry tablets related to your illness. Carry period pills for easing the pain, or a fever pill for feeling better. In addition, if you have cute pill organizers, you wouldn't mind carrying one, I'm sure. Avoid eating outside, especially during monsoon. Pack a lunchbox and gain some energy in the breaks. You can also hog onto some nutrition bars. I mean it. I know some girls who are such misers, that even when they are on the first day of their periods, still walk or travel by train or a crowded bus. Dear readers, it's all right to use the money for comfortable taxi rides once a while. Do not be a hoarder, and don't save money during such times. It's advisable to travel comfortably in a taxi or an auto. You would save a lot of energy of yours, and get the warmth of a taxi/auto too. Even though it hasn't rained in Mumbai for two weeks, still I would carry an umbrella. 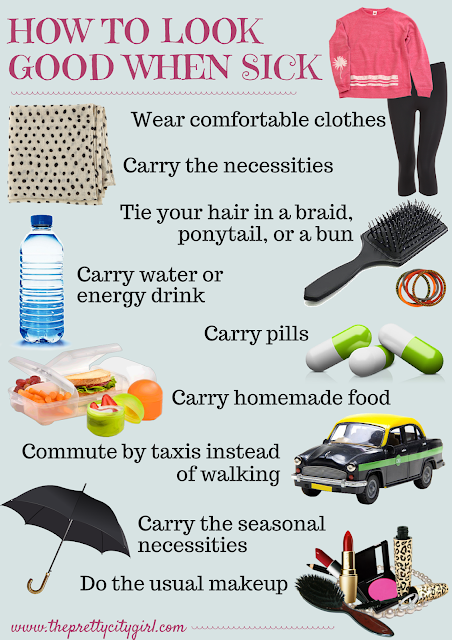 Yes, you can carry a scarf or a hat in summers, mufflers and beanies in winters, and umbrellas in monsoon. Even though you know the weather wouldn't be that harsh, still carry these seasonal essentials. We often give up and don't pay attention to our face when we're sick. We hardly apply kohl, and that's it; we're done. I would suggest you use some more energy, and do the everyday routine makeup, in order to look fresh and just like you would look on any other day.